It should help in assessment and audit. HITB 2007 was great this time around as well. Both class and talk went really well. Speakers were good and was able to learn new stuff. All material is posted here. 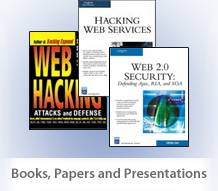 I presented on Web 2.0 hacking, keeping focus on Ajax and Web Services. Added some new demos for better understanding. Presentation movie is not yet posted. Following is my presentation.